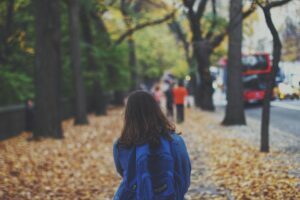 Hypnotherapy Directory member Dean Learoyd explores the topic of back to school anxiety, and how parents can help their child overcome it. They may be feeling sick, they may have a headache or tummy ache, or simply find it difficult to get out of bed and get dressed in the morning. These are some of the more obvious telltale signs of ‘back to school anxiety’. Other more subtle symptoms may include issues with going to the toilet, signs of obsessive behaviour, bed wetting or emotional outbursts. Younger children in particular tend to express anxiety by complaining of physical symptoms like headaches or stomach ache and are more prone to crying and tantrums. In teens or adolescents the symptoms tend to be similar to those in adults, for example being angry, non-cooperative or irritable. The first day back after a break or an illness can be stressful enough for an adult, so anxiety and stress should never be underestimated in children. 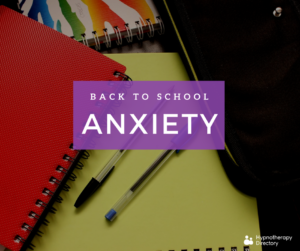 Apart from the stress of simply returning to a controlled environment after a long summer break or holiday, there may be many causes for ‘back to school anxiety’ and it is important that parents and teachers alike are aware of how to cope if a child does show signs of anxiety. There can be many causes for this type of anxiety, including exam nerves, finding schoolwork difficult, friendship issues, bullying, or even worrying about things at home (divorce, money worries etc). There may also be issues that are hard to spot such as dyslexia, learning difficulties or undiscovered autism. Some parents find it extremely difficult to cope with children who don’t want to go to school and as a result may end up keeping them at home to avoid conflict. All this serves to do is reinforce the child’s original thoughts and fears about school and it can often make the issue worse. It is so important to have dialogue with the school and to work together to try and resolve the issues that are troubling the child. Stress and anxiety in children is more common than ever before, as today’s fast paced multimedia society makes demands of everyone, and it’s important that parents and teachers are made aware of how to handle stress and anxiety as soon as it is spotted. The key from the start is not to be dismissive of the child’s feelings and to encourage the child to discuss them, letting them know that it’s okay to feel bad about something. Allowing the child to maintain their routines (meals, bedtimes etc) can also help as it keeps some semblance of balance in a changing environment. Being healthy is vitally important too and a good diet and plenty of sleep and exercise can contribute to reducing stress levels significantly. Of course we all want the best for our children but we must also remember that heaping overly ambitious expectations on them and their achievements is far too common these days; it can cause the child often to feel that they are letting you down and make them have feelings of low self-worth. Plenty of encouragement and avoiding criticism is important here, as well as avoiding placing pressure to achieve upon them. Sometimes we need to remember that our kids need their own space too, and if they don’t feel like talking it’s important to let them know you are there for them and remind them they are loved. Remember also that as children grow they learn from their environment and from significant people in their lives as well as their peers. Setting a calm, positive example is key. The more we are able to create a calm, stress-free environment at home, the less likely it is that anxiety in a child will be a problem. Hypnotherapy can be a very effective treatment for child anxiety and stress. Children have such creative imaginations and usually find it easy to visualise, making them ideal candidates for hypnosis. Hypnotherapy will help to change the child’s negative thoughts and feelings associated with returning to school and can also be useful to establish the real root cause of the problem. Children often find it difficult to express how they are really feeling, and why they feel like they do. The hypnotic relaxation is a great way to help them articulate their thoughts in a calm and relaxed way, allowing them to explain how they feel about their daily lives. Children, by virtue of their open creative minds and vivid imaginations, usually find it very easy to go into a hypnotic trance. There is, therefore an increased probability that hypnotherapy will succeed in opening the subconscious to powerful thought-changing suggestions. The relaxing nature of hypnotherapy is also good for the child, in that an overactive imagination can often be a creator of negative thoughts and feelings (especially in relation to school). Indeed, in many schools now have introduced meditation as a way to relax children, aid concentration and focus and to release the stresses associated with being young. One of the other major positives about hypnotherapy as an intervention for children is that, compared to many other types of treatment, it can be both enjoyable and fun so the child is much more likely to take part in a positive way and even ‘look forward’ to sessions making success much more likely.